You bet we'll buy your precious metals from you! Look, we know that one of the biggest worries a first-time buyer of precious metals often has is: "How will I sell my metals quickly and get the best possible price?" Great question. Well, Money Metals Exchange not only sells metals at premiums that are super low, but we pay buy back prices that are well above virtually all of our competitors. We happily buy any of the popular forms of precious metals that we offer for sale (and even a few others), regardless of whether you purchased from us or not. We send payment quickly and, as always, our prices are hard to beat! Of course, you can try to sell your gold and silver to a local coin shop – but because local outfits are never as large as our company, they are rarely in a position to offer you as high a buyback price. They simply don't have a rapid turnover of inventory. Whether you are in a hurry or not, all you need do is call us to lock your sale price. A simple transaction – safe, secure, private, and no hassle. Further procedural details appear below. As you may have heard from a member of our growing legion of happy customers, your transactions with us are strictly confidential. 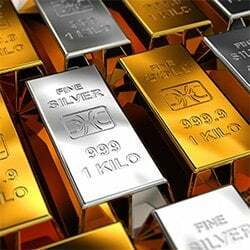 Our service quality is so high that we have received literally hundreds of customer comments expressing appreciation for the way they are treated when buying or selling from Money Metals Exchange. So whether you are looking to sell silver, sell platinum, sell palladium, or sell gold (online or off) we have some of the best payouts – usually paying the current spot market price or above. Money Metals Exchange will happily buy any of the products that we offer for sale, regardless of whether you purchased from us or not. We send payment quickly and, as always, our prices are hard to beat! Navigate to any of our product pages and use the "Click Here to Sell to Us" link located just below the product photos. Or call us at 1-800-800-1865 between 7:00 a.m. and 5:30 p.m. (Mountain Time), and one of our representatives will quote you the current buy-back price. If you wish to sell, we will lock your sell price over the phone and send you a Purchase Order. Pre-1965 Dimes, Quarters & Half Dollars (Junk Silver) should be identifiable as having been minted prior to 1965. You can easily buy US coins online or over the phone. Ship the metal to us via U.S. mail, insured for the full value. We will provide shipping instructions when you call. We receive and inspect your shipment and send your payment immediately. 24 karat gold is softer than 22 karat gold. Coins like the popular gold Canadian Maple Leaf are more susceptible to being scratched or damaged due to being softer. They need extra care to ensure that they remain in good condition. Some tubes of silver have empty space at the top of the tube even when they are full. Coins like the Canadian Silver Maple Leaf coin, British Royal Mint Queen's Beast series, or silver American Eagles all have extra wiggle room at the top of their tubes. Add a small piece of paper or a couple of cotton balls to ensure that they are not damaged. All government minted coins, by law, MUST have a legal tender value to them so that governments can mint them. They will have a legal tender value associated to them such as the New Zealand HMS Bounty will have, "Two Dollars" on the reverse side of the coin. Keep in mind that depending on the country that the coin is minted in the legal tender will change. For instance, the silver Austrian Philharmonic has a legal tender value of, "1.5 Euros" on the reverse side of the coin. Privately minted rounds are minted by private mints and do not have a legal tender value stamped onto them. ALL coins, rounds and bars will have both the weight and purity of the precious metal stamped onto the coin. For example, the 1 troy ounce silver Walking Liberty Round has the weight of "1 troy ounce" and purity of ".999 pure silver" stamped directly onto the round. Junk silver will NOT have the weight or purity stamped on it however. All U.S. minted coinage prior to 1965 were minted with 90% silver and half dollar coins for sale minted from 1965-1970 were minted with 40% silver. "I have a silver coin or round and I'm not sure what it is. How do I find out?" This is a common question and easily answered in one of two ways. Use our extensive website to look for the coin or round you think it may be. We have detailed pictures and even videos for all products! If you have a 1 ounce silver coin/round try starting in the 'Silver' section and search for the 1 ounce size. 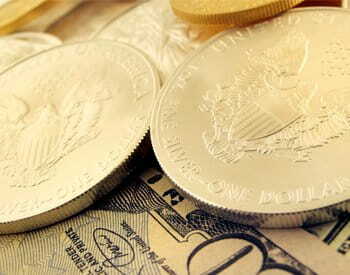 Call one of our expert precious metals specialists at 1-800-800-1865 and describe the coin/round to them. Chances are they will know right away what it is and can quote you a price right there! "I have some gold and/or silver coins that are no longer Brilliantly Uncirculated (they have visible tarnishing, scratches or some other defect) will you still buy them?" YES! We do buy coins or rounds that are no longer Brilliantly Uncirculated. We buy them back at our "Bargain Bin" price! Ensure that all tubes are stuffed with either paper or cotton balls to avoid rattling. Tape ALL tubes shut with tape to avoid them breaking open during transit and being damaged. Wrap heavier objects (like 100 ounce bars) in bubble wrap for additional protection. Ensure that items like Junk Silver or any other potential loose items are enclosed either in a bag or small box. Items that are left loose often get lost or damaged in transit. When taping the box to use make sure that all edges and seams are tape fully. It is common that packages are exposed to the elements and open seams can lead to water damage. Taping all seams also ensures that no coins could fall out of the box in transit. When putting product into the box for shipment ALL space must be filled with packing material. Any empty space will allow product to move during transit and be susceptible to damage. Heavier packages MUST use packing paper over other alternatives that cannot handle the weight as well such as packing bubbles or peanuts. Any smaller items like individual coins or even tubes should be put into a smaller box to ensure a safe transit. Packages over 5 pounds need to be double boxed to assist with the additional weight. Do a last check to ensure that all seams are taped, there is no rattle inside the box, all empty spaces inside the box are filled with packing material and that all products listed on your P.O. have been enclosed in the shipment. Add your label and put a small strip of clear tape over the address incase it is to be scratched during transit. Make sure to separate different types of coins/rounds before sending them in. Depending on what type of coin or round your silver is could change the price that we are buying them back at. For example, Silver American Eagles for sale are generally bought back at a higher price compared to privately minted rounds. Knowing what you have before you send in your silver will help to ensure that you know exactly what you're getting paid. Separate any silver that looks like it may be tarnished, scratched or otherwise not B/U (brilliantly uncirculated). We sell most of our items as B/U and if they do not fall within that category we generally sell them for slightly less. Ensure all silver items (bars, coins, rounds etc.) have BOTH their weight and purity stamped directly on the item. Any items that do not have their weight AND purity stamped onto the item cannot be bought by Money Metals Exchange. Learn more on what are the best silver bars to buy for sell back purposes, along with which coins and rounds are the best fit for you. If you have Junk Silver ensure that all coins are dated pre-1965 for their 90% silver content or dating 1965-1970 for 40% silver content. Anything past 1970 is only worth its face value (a quarter would be worth $0.25). Also, for Junk Silver dates, ensure that the dates are legible. Junk Silver was used as U.S. currency and because it was in circulation it can be a variety of different conditions. Some coins may be more worn than others and ensuring that the dates are still legible is an important process. Before sending in full tubes of coins ensure that all coins/rounds are accounted for. Depending on the size of the coin/round and a few other factors some tubes may hold fewer or more coins than others. Counting all tubes prior to shipping is an important step to verify that all silver is accounted for. 24 karat gold is softer than 22 karat gold. Coins like the gold Canadian Maple Leaf are more susceptible to being scratched or damaged due to being softer. They need extra care to ensure that they remain in good condition. Gold bars are often times in an assay, an assay is a plastic packaging that validates the bars weight, purity and mint that it was minted at. Many assay's have tamper proof cases the indicate when a bars assay has been opened or tampered with. Inspect any bars and their assay's to ensure that they are in good condition and that the assay has not been tampered with. We test ALL items sold to Money Metals Exchange in house and are able to test bars inside of assay's so do not remove bars from their assay. Fractional gold coins, rounds and bars can be very small and often times confused for one another. Look closely at the coins or rounds to verify that the weight is the same as the one that you are selling to us. 1/10th oz coins and 1/4 oz coins are easily mistaken for one another. 1933 gold coins have a 90% gold content which is less than newer bullion that is generally 22 or 24 karat gold. If you have any pre-1933 coins be aware that the gold content is less than some other bullion options and the buy back price will reflect this. What is the difference between 22 karat gold and 24 karat gold? These two types have a different PURITY meaning that 24 karat gold contains 24 parts pure gold and 22 karat gold contains 22 parts gold and 2 parts of other metals added as alloy. The purpose of a 22 karat gold coin is to increase the coins hardness. Gold is a very malleable metal, meaning that it is bent easily. By adding 2 other parts of metal to the 22 parts of gold allows 22 karat coins to be harder in comparison to a 24 karat coin. This is only referring to the coins purity however, coins generally still share the same weight as in 1 troy ounce of gold. Therefore, a 24 karat 1 ounce gold Maple Leaf has the same gold content of a 22 karat American Gold Eagle bullion coin; 1 troy ounce of gold.